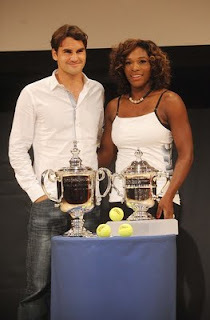 Roger Federer and Serena Williams at the 2009 US Open Draw Presentation at The Times Center. Photo by Brad Barket/Getty Images North America. And would Hizzoner like to see Serena [Williams] win? It could happen, but not because of a Williams/Williams U.S. Open final. David Dinkins, former New York City mayor and tennis fan/player/advocate and others at The Times Center this afternoon got the sad news when highlights of the U.S. Open draw were aired live on ESPN. The sisters can’t meet in the final because they are on the same side of the draw (player matches). But they can meet No. 1 seed and world No. 1 Dinara Safina of Russia or No. 5 seed Jelena Jankovic of Serbia, her countrywoman Ana Ivanovic (No 11). And a passel of other Russians: Elena Dementieva (No. 4), Svetlana Kuznetsova (6) and a re-emerging Maria Sharapova (29). If the sisters fail to reach the final, any number of players could be the culprit: unretired/ unseeded/unbowed Kim Clijsters (Belgium), 14th ranked Frenchwoman Marion Bartoli and her countrywoman Amelie Mauresmo (17). Good news on the men’s side: There can be a Federer-Rafael Nadal final. Actually, most tennis fans would probably rather see Federer play the former No.1/No.2 and current No.3 Spaniard over Roddick (No. 5) whom he can’t meet in the final anyway. Their faceoff would happen in the semifinal because, like the Wmses., they are on the same side of the draw. Number 1 ranked Federer could meet the Aussie Lleyton Hewitt (31 ) in the third round, James Blake (21) of the United States in the fourth round and Serbian Novak Djokovic (No. 4) in the semifinal. In the final, Federer (or Hewitt/Blake/ Djokovic/German Tommy Haas ) could meet any of the following players: of late, the great Scot Andy Murray (No.2 ), the red-hot Argentine No. 6, Juan Martin del Potro, Frenchmen Jo-Wilfried Tsonga (7) and Gael Monfils (13), Tomas Berdych (17) of the Czech Republic. There are myriad potential matchups, all based on who advances and who falls. It’s an exciting draw on both sides, which ESPN’s show didn’t capture. The anticipation level came nowhere close to March Madness as promised by SportsCenter anchor Chris McKendry, though Patrick McEnroe and Mary Joe Fernandez did their best. I wonder though, could that be put down to the fact that the “draw” was already done by the time of the broadcast, eliminating the natural element of surprise, which may have informed the commentary? In fact, as PM and MJ were talking about the contests, drawsheets were being distributed in the auditorium at The Times Center. The U.S. Open (31 Aug.-13 September) will be aired live on ESPN2. For official news (including the entire 128-player draw on the women’s and men’s side), from soup to nuts, do visit http://www.usopen.org/en_US/index.html.